Will oxidize, but will loose structural integrity due to rust long after we are all dead. We recommend that you liberally coat these heads with the blood of numerous animal body cavities that you passthrough over the years with the same exact head. The oxidizing process will not effect the performance of the head and if you get rust on the animal it is ok as you are trying to kill it. We will put our Proprietary SR Stainless Steel up against all other stainless steels and high carbon steels on earth for shock resistance and even some entry level tool steels. We will put these heads up against any other head on earth for shock resistance and edge-bevel integrity through offside ribs other than our own S7. Our proprietary S7 offers almost 3X the shock resistance of our Bridgeport Ultra-High-End 41L40 Tool Steel Heads and is sourced from the best S7 on earth. This is the only material choice to build the most shock resistant broadhead possible. CNC machined high-end stainless steel price...but low priced for premium broadhead class that is otherwise represented by imported heads. Insanely expensive compared to most broadhead brands found at many pro-shops and all big-box stores. Pipeline will take on imported from overseas premium class single-bevels and others for price-point, overall value and performance anywhere, anytime, anyplace. 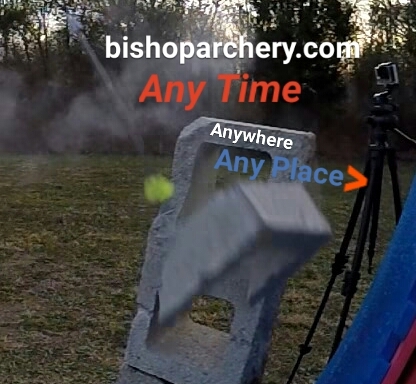 This is our best value when you pick up a few packs of Bridgeport and one single Bishop test head to pull out of your quiver first. This approach represents a cheaper investment and greater value. Our tool steels are exponentially tougher than any stainless steel on earth. For example, pick up nine Bridgeport heads and only one Bishop head of the same model. On the first shot on game you use the single Bishop S7 head and loose nothing in the ultimate in structural integrity. The heads all have the same exact design and point of impact per model and grain weight. This head is priceless to those that are obsessed with practicing, their equipment and bowhunting in general. The Bishop S7 offers the best edge-bevel integrity through offside ribs on earth. This is the king of the passthrough and edge-bevel integrity through offside ribs that you worked your tail end off all pre-season to get to take. This is the best value for those that want the toughest broadhead on earth for the best shot placements, where everything goes right along with the shot placements where everything goes wrong and you need to will that head to get through the animal. Bishop S7 Tool Steel offers our most structural integrity and is our best penetrating head. This head is not a good value if you are saving up for your first bow, or if you shoot hogs out of a helicopter. This head is not a good value if you brag to everyone how sharp and tough your disposable blade style 18-22 degree broadhead bevels are. This head is not a good value if you are not obsessed with doing everything in your power to achieve passthroughs and if you believe wide cuts are superior to penetration. This Bishop S7 is probobly not a good value to you, if you hunted with the widest cutting diameter aluminum ferrule based expandable broadhead that you could find for your elk hunting last year at Wally World. 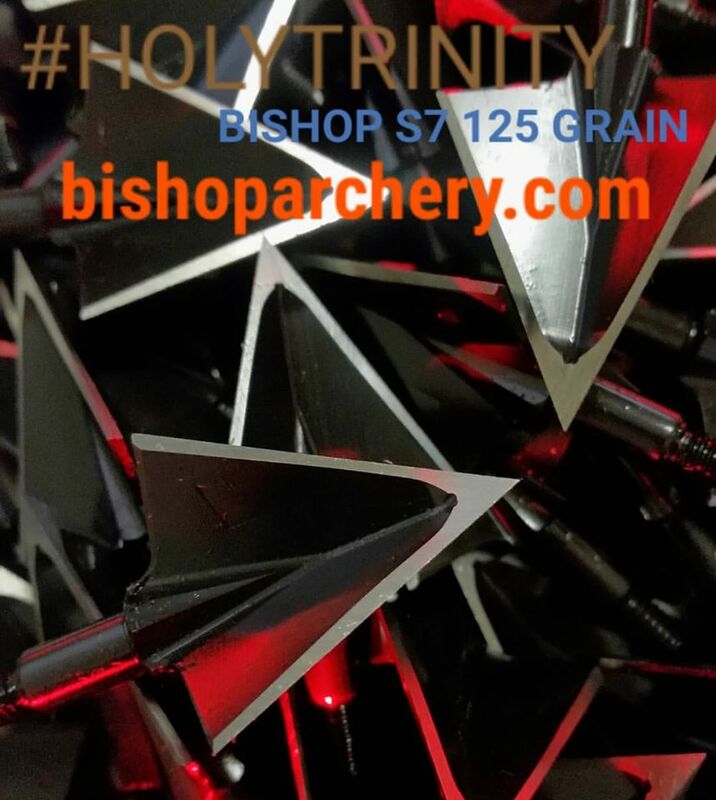 ** Note: The 100 Grain #HOLYTRINITY vented 3 blade heads deviate from above whereas Bridgeport 41L40 Tool Steel is 50 Rockwell Hardness and Bishop S7 Tool Steel is 55 Rockwell Hardness respectively and this is the case only in the vented 100 Grain HT Models. We do this for a reason with these two heads and no we will not over heat treat them for you, as it would decrease their structural integrity and be an ignorant thing to do. The 100 Grain HT Rockwell Hardness is perfect exactly where it is for the ultimate in structural integrity out of this head. All of our other heads are at the Rockwell Hardness in the chart as listed above. 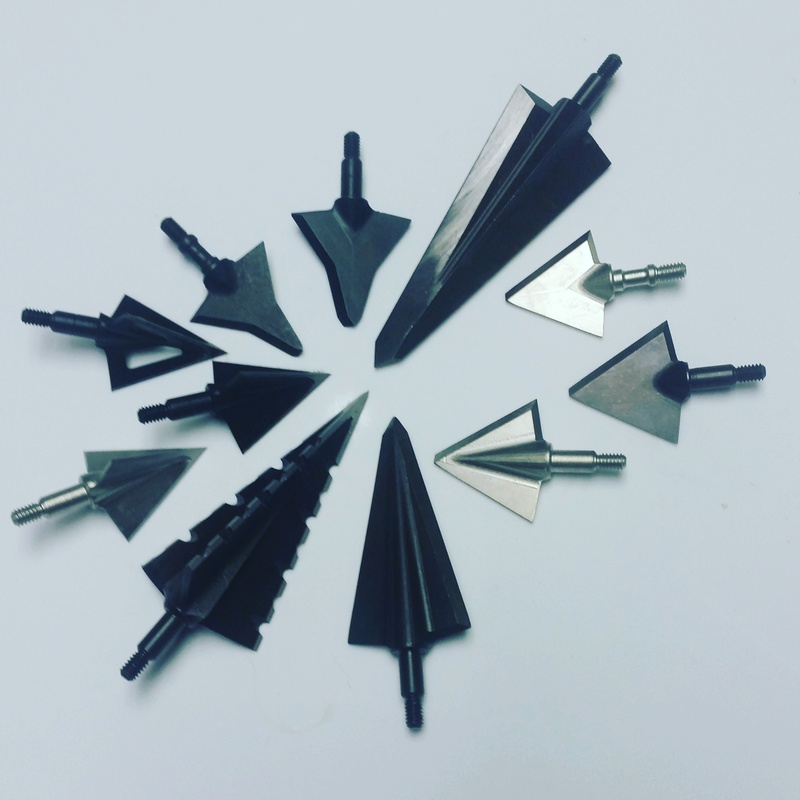 There are numerous measures for structural integrity besides the archery industry standard Rockwell Hardness measure that oftentimes has been publicized with broadhead manufacturing over the decades. Yes, Rockwell Hardness is somewhat of an important indicator of shock resistance based structural integrity, but not by very much at all. 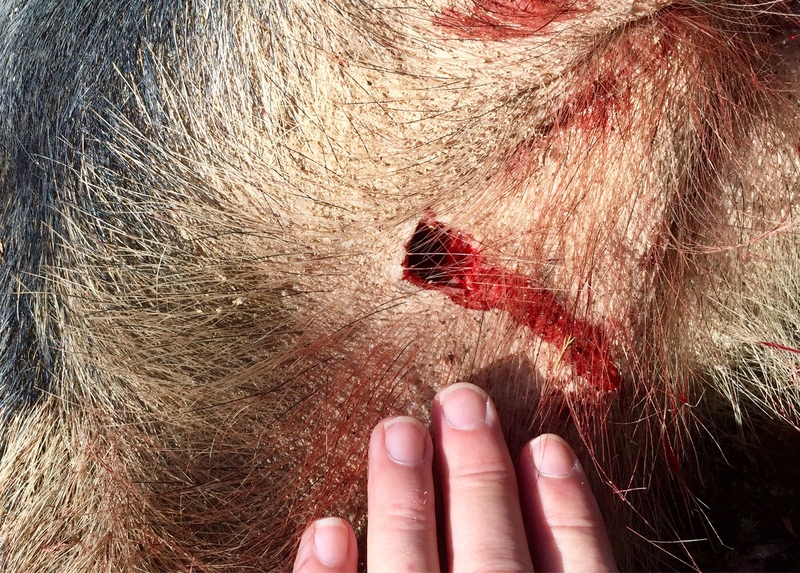 For instance, the actual geometric broadhead designs are often much more important than the materials used to achieve anti-tip curl and structural integrity. Regardless of these facts our metallurgy program is second to none for shock resistance. While we could foolishly heat treat our high-end tool steels and even our stainless steel into the sixties, we have achieved the most shock resistance in the history of a broadhead with our proprietary materials, processes and patent pending designs. Most brands on the market have been over heat treated for the specific application of a broadhead in our opinion and we will put our Bishop S7 and even our Bridgeport 41L40 heads against all other heads in the world for structural integrity. We get a lot of questions about structural integrity and Rockwell Hardness and a lot of people with misinformation from broadhead reports to broadhead salesman out there. Please shoot even our entry level stainless steel heads into cinder blocks next to any other broadhead on earth and compare for yourself. Here is a basic video highlighting why Rockwell Hardness is misunderstood by many knife buyers and bowhunters alike. 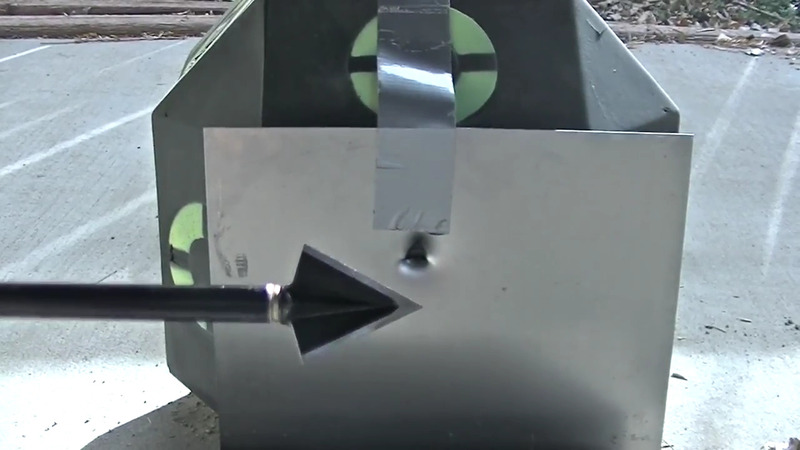 The points made in the video below are for knives, but are even more important for broadhead applications, as much more shock resistance is required for broadheads than knives. 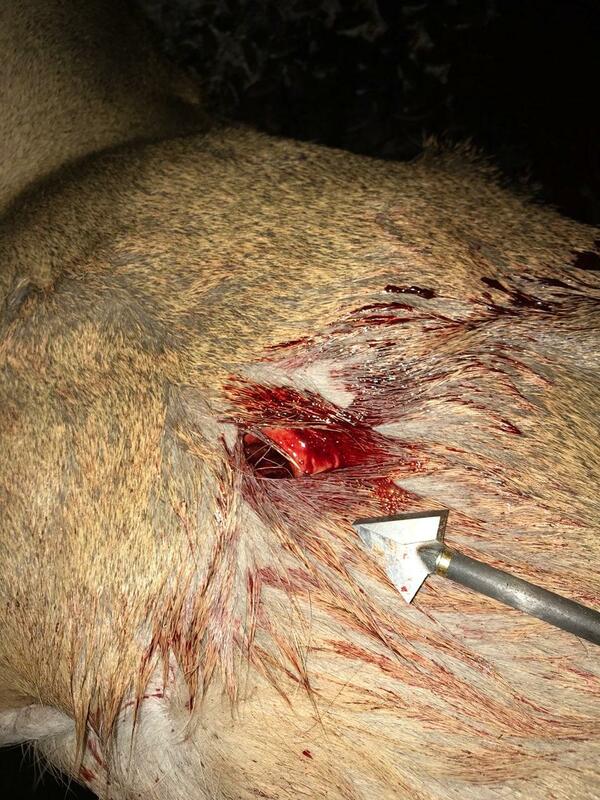 Here are some other measures/metrics of structural integrity that tell a bit more, but are just a piece of the puzzle in overall structural integrity for broadheads tipped on the end of arrows and shot into body cavities containing hide, bone and connective tissue. You really don't need to understand any of these things listed above, or our metallurgy program. But understand that with our heads, we have done our homework so that you can hug the shoulder bone a bit more than ever before with a priceless peace of mind and keep far away from the cursed guts than ever before. After all of your months of hard-work and investments in guide fees, plane tickets, gas, treestands, optics, camouflaged clothes, scouting, licenses/tags, trips to the gym, game cameras, a new bow, practice sessions or food plot planting etc., our metallurgy program and heads will penetrate to the vitals like nothing else on earth and never fail you in this area. The picture above is our measure/metric for broadhead specific structural integrity that any layperson can tangibly wrap their head around. Where most other broadhead construction processes, designs and materials can't even seem to achieve overall broadhead structural integrity on animal impacts at times, let alone edge-bevel integrity, our heads shine through with broadhead and edge-bevel integrity through offside ribs of anything that rooms our universe time and time again. Bishop Bidirectional Mechanical Advantage R&D driven two-blade bone breaching and "OK Sign" entrance channels are nothing like broadhead report style single-bevel "S" slitting broadheads flooded throughout the market. Regardless of the metal you choose...Our Patent Pending BMA Designs, construction processes, metallurgy programs and coresponding heat treat specific to broadhead applications are superior to the sea of broadhead report style broadheads across every single metric.